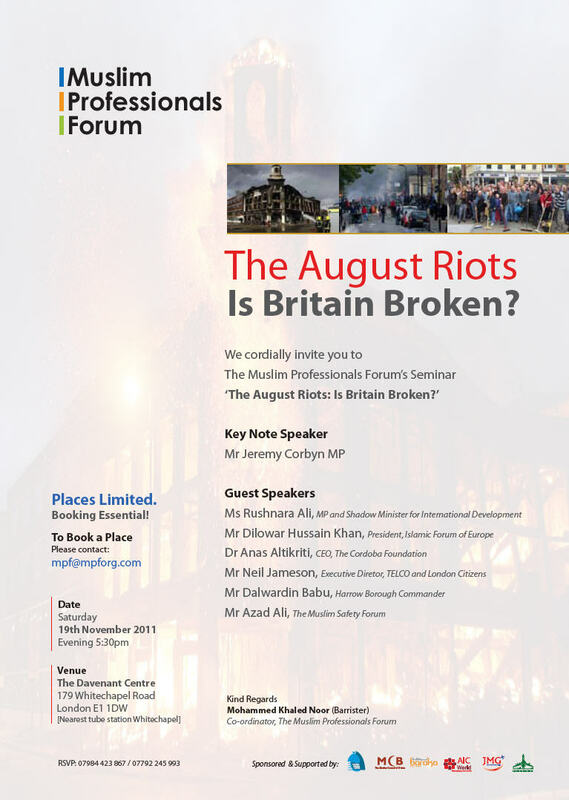 Ever heard of the Muslim Professionals Forum? Me neither. It has a slightly dated website here and it is run out of an office alongside the Limehouse Cut by a Mohammed Khaled Noor. He is an immigration lawyer and styles himself as a “barrister”; he may well be but he is not listed on the Bar Council’s directory. To build a common platform for Muslim professionals and to promote ethical values and understanding. To enjoy, achieve and learn an Islamic way of life and cultural heritage through open and intellectual engagement. To train and prepare Muslim professionals to face modern intellectual challenges. To promote dialogue and ethos of peaceful coexistence among cultures, ideas and people. The keynote speaker is Bennite Labour MP Jeremy Corbyn from Islington, but it’s the list below his name which has caused many eyebrows to be raised. Firstly, there's George Galloway's old pal, Anas Altikriti. He is the former head of the Muslim Association of Britain, often regarded as the UK arm of the Muslim Brotherhood. He's now president of the Cordoba Foundation which has friendly relations with Hizb ut-Tahrir, even to the point of distributing Tower Hamlets council money to them in 2008. Then there’s Dal Babu, a policeman whose rise up the ranks of the Metropolitan Police over the last few years has been astounding. When I was at the East London Advertiser, he was a Tower Hamlets Chief Inspector in charge of press relations. I’m sure he must have been very good at his other roles but in his liaison role, he certainly was not. He regarded the council paper East End Life as the major outlet and he pretty much lost our trust, promising us one thing only to do another, although he did maintain very good relations with Galloway’s Respect team. He then moved to Scotland Yard, became chair of the Association of Muslim Police and two years ago he got the Harrow job. Which does explain why many are concerned at the final name of the list of speakers: Bethnal Green and Bow MP Rushanara Ali. Some are worried that by attending she will be giving what they consider to be an event organised by front organisations for Jamaat e Islami a moderate and mainstream veneer. Some think she is being used, that she’s being set up. Others say she is being hypocritical: that she should not be engaging with what is largely an IFE event when they opposed her becoming an MP. I’ve spoken to Rushanara about this and her position is quite clear: she is the constituency MP, a fellow MP is attending, she has nothing to gain by going, but that it is important to engage in debate and challenge “any intolerable views”. Jim Fitzpatrick, the MP for neighbouring Poplar and Limehouse, takes a different view: he would never attend events with many of these people. I can understand Rushanara’s view and I think I’d like to go along to the debate and listen to the views. The thing is, I’d also like to take my friend. She’s female. I’d like to sit next to her so we can discuss together. But we won’t be able to because the event will be segregated. Maybe that’s how Broken Britain will stop the riots. Apologies for the lack of posts but the day job has been calling.